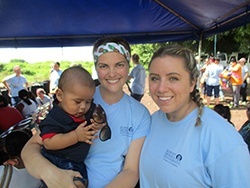 For over 22 years, Dr. Carl Ross and teams of nursing students have had major impacts on many of the communities in Nicaragua. Universidad de Politechnica in Managua, Nicaragua recently honored the amazing Dr. Ross. Mark and Lyn, a sweet and down to earth Canadian couple, are Gran Pacifica’s newest residents. They talk about finding their personal bliss, building their new energy efficient home, and their new life at Gran Pacifica. Jamie Cain, one of our Property Liaisons for Gran Pacifica, first started working for our resort last spring and flew there on a Sunday in the glorious month of June for training. 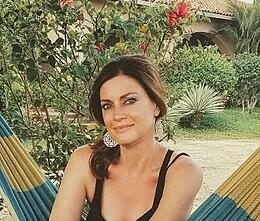 It was her first solo trip to Nicaragua. Years ago, Jamie Cain, one of our Property Liaisons for Gran Pacifica, suffered a fracture in her left ring finger and has been postponing surgery on it since the cost is so high in the U.S. Now that she travels back and forth regularly to Central America, she decided to inquire about having the surgery performed in Managua, Nicaragua. At Gran Pacifica Resort, we enjoy working hard while having fun. 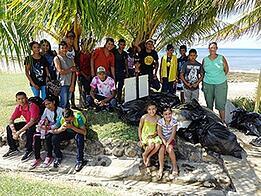 This past December, the corporate social responsibility team invited local students to participate in a beach clean-up and turtle education program. Ah yes! Each New Year is indeed a fresh start. A new beginning. It is a time to reflect on what we accomplished the previous year and what we still need to or would like to put into motion in the new year. At the proverbial ‘end of the day’, it really is all about setting goals more than making resolutions. Since resolutions tend to fall by the wayside fairly quickly, like going on a diet, setting goals tends to make the most sense. So, whether we have short-term or long-term goals, or something in between, setting goals for ourselves is the best approach to bringing about the most amount of positive change. The amazing Dr. Carl Ross has certainly redefined what is means to be a goal-setter and positive change-maker in our world. And for all the positive changes in the lives of his patients, during his 100th medical mission to Nicaragua, he was awarded with the highest honors from the Universidad de Politechnica in Managua, Nicaragua. Also read about the incredible journey of Elkin Zapata, who 10 years ago, received a life-saving and life-changing surgery from Dr. Ross. Gran Pacifica’s newest residents, Mark Davison and Lyn Suderman moved from Vancouver, Canada to Gran Pacifica recently. They talk about their new, blissful lives and building their energy-efficient dream home in our community. We are extremely happy to welcome them and wish them much happiness and continued bliss. 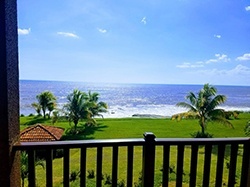 One of our very own Property Liaisons for Gran Pacifica, Jamie Cain, talks about her second trip to Nicaragua, this time flying solo. She describes the scenery as a lush and beautiful land, with fairy-tale like qualities. I couldn’t agree with her more, as there’s nothing quite like butterflies to add a certain fairy-tale like charm to almost anything. 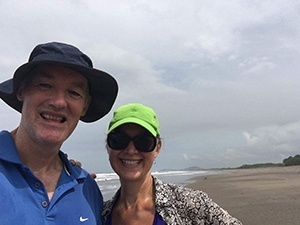 Jamie has written yet another article describing her visit to Dr. Dino Aguilar, an orthopedic surgeon who offices at the Hospital Metropolitano Vivian Pellas in Managua. She describes it as the best doctor experience she has ever had. At Gran Pacifica, two of our top priorities is to make sure our beach stays pristine, and to help preserve the lives of The Giant Sea Turtles- whose little quarter-sized, lives begin at our Turtle Sanctuary. Last month, the Corporate Social Responsibility Team invited local students to take part in our beach cleanup and learn more about the Giant Sea Turtles. Needless to say, the children and everyone else involved had an exciting time, ate a delicious lunch at the SeaSalt Restaurante, and ended the day with soccer and a swim.